[JOHN BROWN, JR.]. 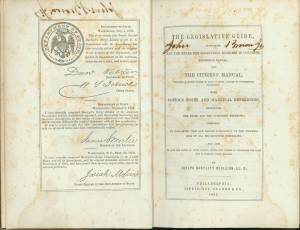 Signed Book, The Legislative Guide, Containing All the Rules for Conducting Business in Congress; Jefferson’s Manual [of Parliamentary Practice]; and The Citizens’ Manual..., Philadelphia, Lippincott, Grambo & Co., 1852, 317 pp., 5 ½ x 8 ¼ in. John Brown, Jr. (1821-1895) was the oldest child of abolitionist John Brown. He married Wealthy Hotchkiss, and they had two children, John and Edith. The Kansas-Nebraska Act (1854) effectively repealed the free-slave state dividing line set at 36° 30’ North latitude by the Missouri Compromise (1820). Instead, new states would decide on slavery’s status within their borders by “popular sovereignty.” The result was a deluge of both pro and anti-slavery forces staking claims in Kansas territory. John Jr. and his siblings joined their father’s anti-slavery fight, and moved to Osawatomie, Kansas, in 1855. John Jr. was elected to the territorial legislature in 1856. He later led a militia to provide relief to Lawrence, Kansas, which had recently been sacked by proslavery supporters. In 1860, he was a Canadian emigration agent, supporting both African Americans and Native Americans. During the Civil War, John Jr. served as Captain of Co. K of the Seventh Kansas Cavalry, but was forced to resign due to illness in late 1861. Sources disagree whether or not John Jr. had knowledge of the Harpers Ferry raid. However, John Jr. (and brothers Jason and Salmon) refused to participate in it, which caused a rift in the family considering that brothers Watson and Oliver (both killed in the action) and youngest brother Owen (escaped) joined their doomed father. Regardless of his involvement in the raid, John Jr. was a committed abolitionist and was subpoenaed during Congressional investigation after his father’s actions. He refused his summons, and when federal marshals went to arrest him, an armed group prevented him from being taken into custody. In 1862, John Jr. moved to South Bass Island in Put-in-Bay, Ohio, where he lived until his death in 1895 cultivating grapes, lecturing on temperance and slavery, and teaching math and science. He defended his father’s actions from criticism for the rest of his life. “John Brown, Jr.,” Rutherford B. Hayes Presidential Center. “John Brown, Jr., of Put-In Bay,” Sandusky History.